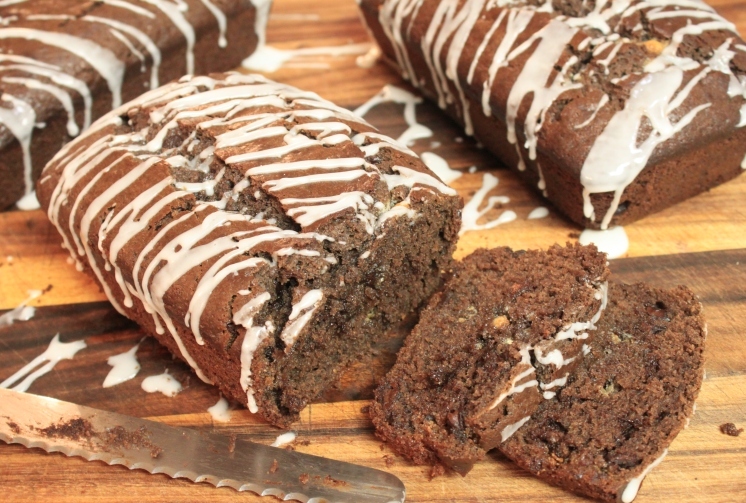 Triple-Chocolate Bread | Rosetta Bakes! I’m pretty crazy about bread, yeast breads and quick sweet breads…..and chocolate! Here is a recipe that is easy to make and fulfills that chocolate craving. This is a moist bread and it’s one you can actually use up some of those half used packages of various chips you may already have in your pantry. If you don’t have the chips this recipe calls for you can add what you have on hand, even nuts if you choose. I happen to have a lot of chips on hand, but if I only had one bag of one type of chip, I would use a cup of whatever chip I had on hand….but, this bread is really good with the various types of chips. You can also add a teaspoon instant espresso coffee or whatever instant coffee you have on hand. I hope you enjoy this recipe as much as I do. Again, I took this bread to work and if vanished very quickly…enjoy! 1. Preheat oven to 350 F. Grease the bottom and 1/2 inch up sides of a 9 x 5 x 3 inch loaf pan. Line bottom of pan with waxed paper or parchment paper, grease paper. Set pan aside. In a large bowl stir together flour, sugar, cocoa powder, baking powder and salt. Make a well in the center of flour mixture; set aside. 2. In a bowl combine egg, milk and oil. Add egg mixture all at once to flour mixture. Stir just until moistened. Fold in white baking pieces, 1/3 cup dark chocolate pieces and 1/3 cup milk chocolate pieces. Spoon batter into the loaf-pan, spreading evenly. 3. Bake for 45 to 55 minutes or until a wooden toothpick inserted in the center comes out clean. Cool in pan on a wire rack for 10 minutes. Remove from pan; peel off paper. Cool completely on wire rack. Wrap and store overnight before slicing. 4. If desire, top each with sweetened whipped cram and drizzle melted chocolate.